So you have a fireplace and a crawling infant or walking toddler. Eesh. This can be a tricky combo—especially if you actually plan to ever use your fireplace. But don’t worry; we’ve got some hearth safety tips and tricks that’ll help make the entire fireplace area a much more tot-friendly place. Based on your specific needs, we’ve rounded up some solid choices to help childproof your fireplace area. Here’s the deal: if you actually plan on using your fireplace, you should get a baby gate. I know, I know, it totally detracts from the aesthetic, but it’s such a relief to have. But it can’t be just any baby gate: you need to make sure the baby gate you choose secures to the walls (i.e., do NOT put a free-standing baby gate in front of your fireplace—these can topple over and you can end up with even more injuries! ), and it should also have an opening for you to easily enter and leave the area when you need to tend to the fire. If you have a wood-burning fireplace, you’ll want to place your gate farther back so that it protects your littles from the open fire’s popping embers and sparks. If you have a gas fireplace, however, you can place your gate much closer. 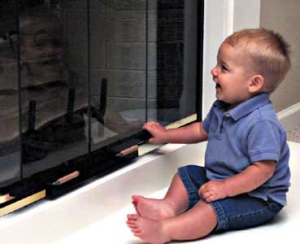 Fireplace gates will also protect your little one from hot glass burns from gas fireplaces, which happen far too often (over 200 children get third degree burns from hot fireplace surfaces every year). For those with a wood burning fireplace, this is even more reason to get a fireplace gate. Otherwise, you’ll have to put your sharp, stabby fireplace tools in a closet somewhere—or perhaps a locked cabinet—and it will be a pain to access them every time. I wish there were a better solution for that. Alas. This adjustable gate mounts to the wall (hardware is included) and has a door that gives you easy access to the fireplace when you need it. You can even keep your fireplace tools inside the gate (near your fireplace) to ensure your tots can’t get to them. Many parents really like this gate and say it does the job well, and a big bonus is that it’s half the price of the competition. Some reviewers complain that the directions are tough to follow and the gate is difficult to install—but let’s be real, any gate like this is most likely going to be a pain-in-the-you-know-what to install. What’s unique about the Qdos gate is that it’s customizable; it allows you to create a gate based on your specific needs and the size of your hearth. It comes with a “starter kit,” which includes two wide sections and a door that, together, fits openings up to 82.5”. If you need to cover more ground, you can purchase extra doors in additional short (8”) and long (23.5”) sections. You can remove this gate temporarily (for a no-kid party, or whatnot); it can easily be detached from the wall mounts without having to use tools. It also comes with anti-skid Floorsafe™ silicone pads to protect your floors from unsightly scratches, and has a Qdos NiteSafe™ Glow Strip, which helps you see the gate in the dark so you don’t slam into it in the middle of the night. Check out some of the ways you can set up this gate, using the starter kit plus extra short and long extensions. This is a much more expensive option, BUT, it’s very highly-rated. Hey—you get what you pay for, right?? This gate includes five 24-inch interlocking sections that can be set up and angled as needed and mounted to the wall. This adjustable gate will fit a standard 6-foot hearth, and includes an extra wide door section that can be placed anywhere in the gate’s layout. If you need this gate to cover a larger area, you can purchase extensions (available in 9 and 24-inch sections). For those with flat hearths, one option is to not use your fireplace. Here’s one solution: put a bunch of different toys right ON the hearth, directly in front of your fireplace. This way, your fireplace will be completely blocked (fireplace? What fireplace?!) and your kiddos won’t even know it’s there. Stepped hearths pose slightly more risk. Wobbly new walkers can easily run into them and hurt themselves on the sharp and rough edges. Not to worry: there are a few different options to protect your little one (and your fireplace!). These highly-rated Roving Cove guards are super easy to use – just adhere with the included 3M double-sided tape – and aren’t…well…ugly. The entire thing is 20.4 feet and includes eight corner edges. Safe for kiddos, they don’t contain any BPA, phthalates, heavy metals, or latex, and are naturally flame-resistant. They are also exceptionally dense and absorbent, so if (when) your kiddo runs into the edge of the fireplace, they’ll be okay (read: they won’t act okay — they’ll scream and cry like they cut off an arm – but you can rest easy knowing that in reality, they are actually OKAY). Note: Roving Cove Edge and Corner Guards come in different sizes and colors. This fireplace guard offers eight feet of coverage and includes five 18-inch edges and two corner pieces, as well as double-sided tape to adhere to your hearth’s surface. Many reviewers really like this product, saying it’s saved their kiddos from several needless bumps and bruises, though others report that it doesn’t stick well to the hearth’s surface, and that their kids can easily rip it off. What sets this product apart is that it covers the ENTIRE hearth — not just the edges — so the whole horizontal surface is now kid/scrape-proof. Not only does this protect your kiddo from falls, but it also creates a little spot for extra seating (I envision sitting on this thing while watching my kiddo play in the living room…so idyllic). The pad is 90 inches across and about 14 inches deep, and attaches to the top of the hearth with double-sided tape. It’s flame-retardant, so you don’t have to take it off when you want to use your fireplace. One downside, according to some reviewers, is that it comes in three pieces, and you have to cut them to fit your hearth. Because it can be difficult to cut straight edges, it isn’t easy to see where the pieces fit together (in other words, cut carefully!!). If you don’t want to spend the bucks to purchase something just to childproof your hearth, use a playmat to cover the area instead. Genius! And if this is too unsightly for you, check out this neutral wood-floor looking playmat. (You’re welcome, LOL). Whether you have a gas burning or a wood-burning fireplace, nobody wants their baby or toddler crawling around inside the fireplace — ick. There are fewer things more fun to play with than soot. My kids have both gotten into the fireplace and they come out looking like Oliver Twist — or maybe Jack Sparrow. The one solution we found for this is a fireplace door lock. This particular fireplace door lock (~ $22 on Amazon) keeps kiddos out of the fireplace and prevents tiny fingers from getting pinched in fireplace doors. You mount it over the handles of your fireplace doors – which effectively locks them – using a Phillips Head Screwdriver. When you want to remove it (you know, to actually use your fireplace), you have to use the screwdriver again (so, in other words, there’s no quick and simple way to do it). This is actually one of the chief complaints about this product. Some reviewers say it didn’t fit, despite their fireplace doors being the correct dimensions for the product; others say the holes in the bars are not aligned properly, making it impossible to install; and quite a few say that, overall, it’s just cheaply made. For those of you who are handy (self not included), you may be able to make something like this yourself. 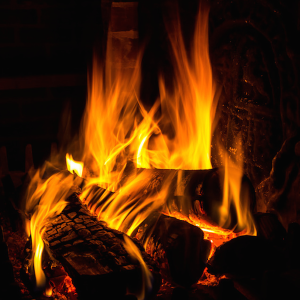 Burning wood, coal, and gas all release carbon monoxide, and when fireplace vents and exhausts aren’t cleaned regularly or properly, the levels of carbon monoxide in your home can reach dangerous levels. Not only fires, but household appliances like heaters, boilers and cookers are also responsible for many CO poisonings. Because children have such small bodies, they are more susceptible to the effects of carbon monoxide. Symptoms of carbon monoxide poisoning can include headache, nausea, drowsiness, confusion, chest pain, and even loss of consciousness. 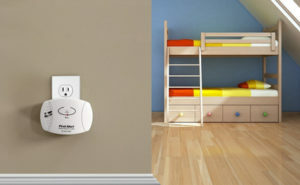 About 20,000 kids a year go to ERs due to carbon monoxide poisoning. Scary. Listen folks, my friend is a first responder and has the scariest stories about carbon monoxide poisoning — you do not want to mess with this!! He said the other day that this one family was about an hour away from a “forever sleep”. Like wearing seat belts and helmets, it’s just what we do now. If your home was built or remodeled recently, you *should* have a CO detector hardwired on every floor of your home; it’s usually integrated into a smoke detector. If you have an older home (or, for a quick and dirty solution), check out the Nighthawk AC plug-in CO Detector ($29) because it’s simple to use (just plug it into any outlet), and reliable. When it detects elevated carbon monoxide levels in your home, you’ll know it – an 85-decibel alarm will sound (it’s loud! But in this case, that’s a good thing…). Just remember, it’s better to be safe than sorry. That’s it for now. Until next time, happy toddler-proofing!